Having been born in 1999, on July 24, Angelos Tsingaras's age of 19 makes him junior to the average player of Panaitolikos. Greek, Modern (1453-) midfielder Angelos Tsingaras, who is currently under contract to Panaitolikos in Greece, joined the club July 1, 2016. He played twelve matches this season. He is currently seventh in Super League (Greece) and third in group Gr. 3 of Greece Cup (Greece) with his team Panaitolikos. Concerning the latest matches, Angelos Tsingaras's club won in Super League plus lost in Greece Cup. His shortest spell with a club currently counts ten months in his latest side. To date, collectively he holds one penalty. Lately, he seems to be more quiet since less penalties were given to him than usually. 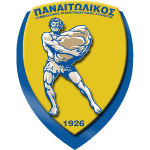 As an expert, Angelos Tsingaras has been subjected to a single team (Panaitolikos). He received the number 37 tricot at Panaitolikos. He reached the twelve appearances milestone as a professionl, the last one being seven days ago. Two years and 10 months was the maximum period Angelos Tsingaras ever played in a team, which is his latest one. Altogether, he was substituted in 5 and out 4 times. Currently, he entered the pit more than he left it which is different to last season wherein he showed an equal amount of both types of subs. He is playing as midfielder in Panaitolikos together with Tasos Tsokanis, Frederico Duarte, Efstathios Belevonis, Franco Mazurek, Ilias Gianniotis, Jorge Diaz, Guga, Dimitris Dalakouras, Marcos Paulo and Adrian Oscar Lucero. Angelos Tsingaras has played for exclusively one professional team.